On January 19, 2015, Mayor John Tory, TTC Chair Josh Colle and TTC CEO Andy Byford held a press conference to announce major changes for TTC riders in 2015. Adult fares will rise by 10 cents (from $2.70 to $2.80, or 3.7%) with proportionate increases for passes, senior and student fares. Children under 12 will ride free (the current fare is $0.75 cash or a ticket for $0.60). The cash fare will remain at $3.00. All day, every day services that were cut in 2011 will be restored. A network of key bus and streetcar routes will have 10 minute service except overnight (after 1:00 am). Crowding and wait times off peak will be reduced by modifying the loading standards. Proof-of-payment and all-door loading will be extended throughout the streetcar network. Twelve new Blue Night routes will be added to the 22 now in operation. Fifty new buses will be acquired for service improvements. Crowding and wait times during the peak periods for 21 busy routes will be improved. Four new express bus routes will be added. The pool of buses available for maintenance will be increased. Temporary storage will be obtained to house the buses pending new garage construction. Trains on the YUS and BD subways that are now held on standby for emergencies will be scheduled into the regular service. Route management will be improved for streetcar routes to provide more reliable service and better utilize the capacity of vehicles in service. The reliability of signals, track and communication systems will be improved with more resources for maintenance. 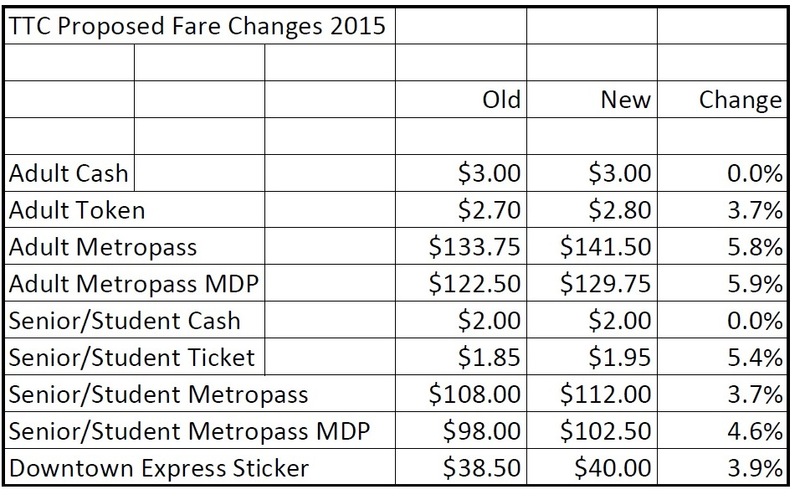 Updated Jan. 19, 2015 at 4:00 pm: One sour note in the announcement is the fact that the Metropass multiple will go up from 49 to 50 giving a new price of $141.50 vs the existing $133.75, an increase of 5.8%. In the midst of an otherwise upbeat, positive set of recommendations, it was a poor choice not to mention that frequent users would pay a higher increase for TTC fares. This continues TTC management’s desire to bump the pass pricing up on the basis that frequent users are getting too high a subsidy. If that’s the official position of the Mayor and TTC Chair, they should have said so in the press release. Much of this program arose from the August 2014 “Opportunities” report from TTC management. At the time, then-candidate Tory argued against these proposals on the grounds that they were unfunded, and behind the scenes, the Tory camp complained that the TTC was supporting another candidate’s platform. To his credit, now-Mayor Tory recognizes the importance of better transit service that can be delivered in the short term, and he has embraced advice from Andy Byford wholeheartedly. Among the lessons he learned was that TTC’s off-peak ridership is higher and growing faster then peak demand, and that investments in off-peak service will benefit a very large number of riders throughout the city. This is an important change from a focus just on peak period, core-oriented capacity. Tory has reluctantly dropped his proposed fare freeze saying that Toronto cannot do this and get on with improving transit. He now argues that fares will go up a bit more, but that riders will get a lot more service. During the press conference, the Mayor made pointed, repeated references to “my predecessor” and “the previous administration” saying that the policy of service cuts and subsidy freezes was wrong. One can be gleeful seeing the Ford era openly criticized by the new Mayor, but that’s not the important point. Simply by making the statement, Tory puts allies inherited from the ancien régime on notice. Better TTC funding is not simply a predictable request from the usual activists and left-wing Councillors, but part of the Mayor’s program. Further details will be revealed in the City Budget Launch on January 20, and at the TTC Board’s own budget meeting on February 2. Implementation of this plan is contingent on Council approval, although the new fares (which can be approved by the TTC itself) will take effect March 1. Service changes require lead time for planning, staffing, and in the case of the new buses, acquisition of vehicles and a storage yard. In practice, the changes will likely roll out beginning later this spring with the majority of service improvements coming in September or later. This will also limit the cost of new services to a smaller part of the year, although full-year costs will have to be absorbed in 2016. The maps in the Opportunties report (linked above) show the range of routes that will likely be affected by the various proposals. I checked with TTC officials at the press conference, and although there may be minor changes, these maps give substantially a good idea of where the improvements will be. Of the many opportunities proposed in August, the one which is notable by its absence is the two-hour fare. There is only so much money to spend on a new fare structure, and rebuilding service takes priority this year. However, the need for a simpler “transfer” mechanism on the TTC will be forced by the Presto implementation which Andy Byford is pressing Metrolinx to complete by the end of 2016. This will more-or-less force the question as part of next year’s budget planning. During the scrum, the inevitable question to Mayor Tory was “how will you pay for all of this”. Tory demurred saying all would be revealed at the Budget Launch. An important point, however, is that he plans to keep tax increases to inflation, but the Scarborough Subway tax will be outside of that “inflationary” envelope. This is a very good start for the Tory/Colle era of TTC policy-making. Rather than cherry-picking a handful of improvements that might benefit only a small segment of Toronto, they have opted for a variety of changes addressing many submarkets within the TTC’s ridership. If this continues in future years, by the time the TTC and Metrolinx open new rapid transit lines, Toronto will have a much improved surface network linking riders to new and improved trunk routes. Updated October 17, 2014 at 4:15pm: Information from Metrolinx about the revised design for the Air Rail Link spur line from the Weston subdivision to Pearson Airport has been added. 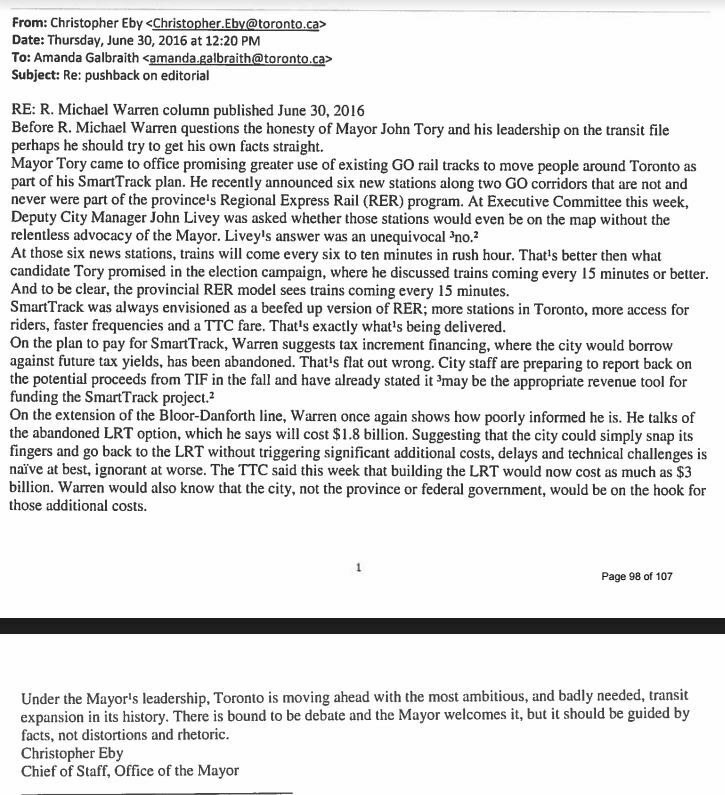 John Tory’s SmartTrack proposal has been roundly criticized by various people, including me, on a number of counts. When one looks at the scheme, it is the technical issues — the degree to which SmartTrack will crowd out the Metrolinx RER scheme (or simply take over its function), the question of capacity at Union Station, the route along Eglinton from the Weston rail corridor to the airport. But the biggest challenge is the link from the rail corridor to Eglinton itself. And it’s interesting to note that very little criticism deals with the basic merit of the proposal as an addition to Toronto’s transit network. The design logic to address major commuting problems is self-evident; analysis to date indicates high ridership and cost-recovery potential that is expected to be confirmed by more detailed post-election studies; and it is modelled on successful international best practice. Criticisms have, instead, focused on the line’s “constructability” where it meets Eglinton Avenue W. and on Tory’s proposed financing scheme. As already briefly discussed, however, the constructability issue is truly a tempest in a teapot. And with respect to financing I would suggest that all three mayoral candidates and most of the popular press still have this wrong. In fact, constructability and the technical issues are precisely what could sink this proposal. Dismissing this as a “tempest in a teapot” is a neat dodge, but it is the academic equivalent of “you’re wrong because I say so”. Many who support Tory’s campaign see criticism of SmartTrack as the work of naysayers who, like so many before us, doom Toronto to inaction. This is tantamount to saying we cannot criticize the plan because doing so is disloyal to the city’s future. Never mind whether the plan is valid, just don’t criticize it. Miller’s comments in his op-ed piece (linked above) also don’t line up with statements in the “Four Experts” article of October 9 where he and others talk about what SmartTrack might do. Miller is much less in agreement that SmartTrack could achieve what is claimed for it. Should we dismiss his comments as being irrelevant or counterproductive? Of course not. This article deals with the challenge of getting from the rail corridor to a point under Eglinton Avenue West at Jane Street, the first stop on the journey west to the airport. To put all of this in context, it is vital to look at the details of both the Eglinton Crosstown LRT (including amendments) and at the Metrolinx Georgetown South project in the rail corridor.